I was only in Athens a little over a week the first time I got here. It was a bit hectic; I had a lot of programming and other IT work to do. I ended up writing a major application and making significant changes to a couple of other applications. I was a bit concerned that there were a lot of bugs in the programs I worked on. Fortunately, everything has been going quite smoothly. Of course, it is one thing to hear that everything is going smoothly, and it quite another thing to experience everything going smoothly. I got here late yesterday afternoon, and I cannot believe how relaxed all of the technical people are. Everyone who is working here is tired and stressed out, but no one seems to have the deer-in-the-headlights-end-of-their-rope-about-to-go-postal look that typifies people who have been screamed at one too many times. A true metric of how things are going can be determined by looking at what I did today. Rather than having to sit in the press center banging on the keyboard all afternoon, I was able to go through the Olympic park and visit the SI hospitality tent. The Olympic park was a lot of fun to walk around. It is really great to see fans from all of the different countries dressed up in their country’s colors and flags. The babble of languages is comforting, and it truly makes you feel like a citizen of the world. 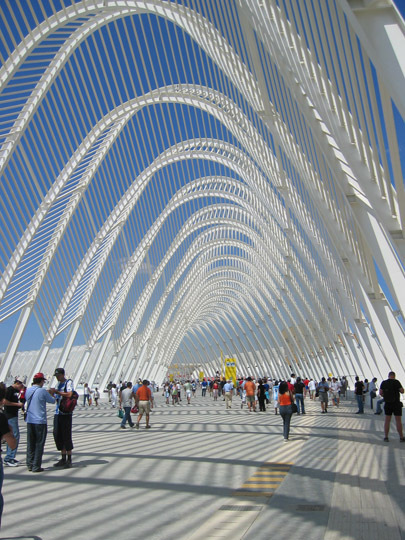 The architecture of the Olympic venues is impressive. Built around 460 BC, the “Stoa” was the seat of the Royal Archon, thus it was also known as “Royal Stoa.” In this Stoa, the council of Aeropagus held its meetings and the laws of Solon, which are credited with the founding of Greek Democracy in ancient Athens, were displayed. I fixed the punctuation in the preceding quote, but I think it is a bit clear that it is translated. I know that some readers of this page may think that this is a giant joint. 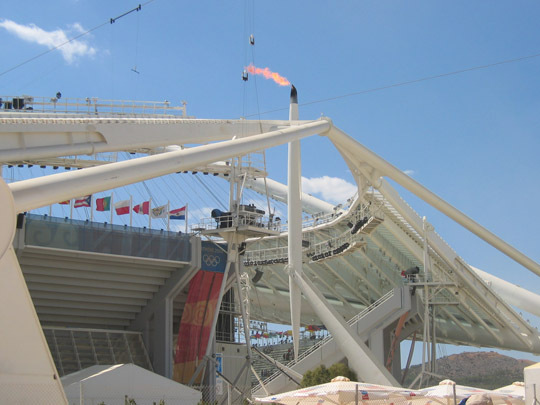 Do not attempt to smoke the Olympic Stadium torch. The torch is made out of metal and fueled by some oil-based liquid. It is not made out of paper and fueled by pot.